An array of revamped and classic pass options offer the ability to customize your perfect festival experience. Tickets for the 43rd Annual Telluride Jazz Festival go on sale in two weeks on Friday, February 1st at 10 am (MT). Festival organizers, SBG Productions, offer a variety of pass options to help you build your perfect experience. From luxurious Patron and VIP options, to all-inclusive 'All That Jazz' Passes and regular 3-Day Passes, there's something for everyone. Below we've listed the benefits of each pass so that you can compare side-by-side to find out which experience suits you best. Enjoy an on-stage viewing platform, close to the performers featuring a beautiful mountain backdrop offering the most intimate festival experience possible. “The Whisky Barrel” - an on-stage bar serving up beer, wine and specialty, craft cocktails throughout the festival. Enjoy special backstage access featuring catered meals by chef Josh Klein, a complimentary bar, covered dining area. Kick off the festival with a private opening concert at the historic Sheridan Opera House the night before the festival begins. The Patron area offers a clear, unobstructed and up-close view of the stage featuring one of the most intimate concert experiences available. Safari Cabanas offer shelter or just a great place for your group to call "home base" during the festival. Enjoy the Main Stage entertainment from the comfort of your own Safari Tent curated with luxurious conveniences and a concierge service. 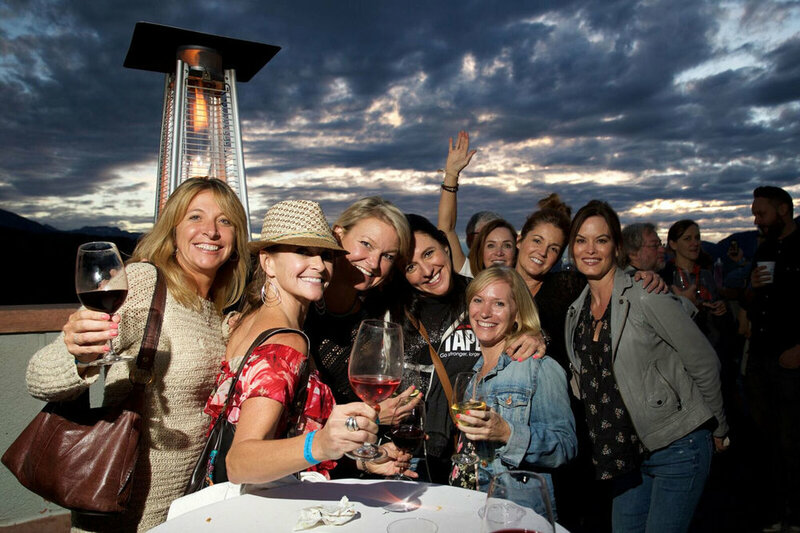 Patrons can enjoy a luxurious opening reception to kick off the festival at the Taste of Telluride and Top Chef event at the Peaks Resort. Pop-up Jazz performances between Main Stage acts are one of the many amenities the Patron/VIP lounge has to offer. By far the most luxurious pass option, the Patron Experience features exclusive top-notch amenities making for a truly memorable festival. Patron pass-holders are treated with access to an on-stage viewing platform and a full stage-side hosted bar. In addition, pass-holders receive backstage access to a dedicated Patron Area serving catered meals throughout the weekend. Pass-holders start the weekend with a welcome reception featuring the celebrated “Top Chef and Taste of Telluride” event, followed by a private opening concert, an open bar all weekend long showcasing the best in craft beer, wine and specialty cocktails, entry to “Jazz After Dark” on both Friday and Saturday nights, access to the Patron/VIP Area inside the Festival, seated viewing area in front of the Main Stage and much more. A portion of each Patron Pass, $400, is tax-deductible charitable donation to the Telluride Society for Jazz. Attending with a group? Think about a private Safari Cabana﻿! "Satchmo's Bloody Mary & Maria Bar"
Enjoy a Bloody Mary bar on Sunday morning complete with exclusive meats and cheeses, fruits and vegetables, assorted hot sauces, traditional accoutrements and premium spirits. Enjoy an open bar all weekend long showcasing the best in craft beer, wine and specialty cocktails at stage-view bars in the VIP Lounge Area. Enjoy the music from an exclusive, less crowded Patron/VIP Area inside the festival with uninterrupted stage views and a covered, heated lounge with relaxed seating. The Patron/VIP area also features yard games and fire pits. Skip the lines! VIP attendees will receive early, priority entry into the Festival grounds each day. Treat yourself to a weekend in style! The VIP Experience shares some of the same benefits as the Patron Experience but not quite as extensive. VIP festival-goers will enjoy a hosted, open bar throughout the festival, access to the exclusive Patron/VIP area inside the Festival grounds including yard games, fire pits and a covered, heated lounge with direct stage views, unobstructed stage-front seating, priority check-in at the box office, priority festival entry, upscale restrooms and more. Attending with a group? Think about a private Safari Cabana! Night Owl? Consider an ‘All That Jazz’ VIP Pass for access to "Jazz After Dark" shows on Friday and Saturday nights. These specialty tents are outfitted with comfortable decor, a covered front porch, fire pit and relaxed seating for eight. Safari Cabanas are a great place for groups to spend the day or just call their home base in Telluride Town Park. Safari Cabanas are the ultimate way for groups to attend the Telluride Jazz Festival! Enjoy the Main Stage entertainment from the comfort of your own Colorado Yurt Cimarron Tent curated with luxurious conveniences and a concierge service. Safari Cabanas are the ultimate way for groups to attend the Telluride Jazz Festival! Enjoy the Main Stage entertainment from the comfort of your own Colorado Yurt Cimarron Tent curated with luxurious conveniences and a concierge service. These specialty tents are outfitted with comfortable decor, a covered front porch, fire pit and relaxed seating for eight. A Safari Cabana is a great place for groups to spend the day or just call their home base in Telluride Town Park. Exclusively available for VIP and Patron pass-holders! "All That Jazz" allows entry into the Festival all three days and entry into all "Jazz After Dark" late night venues on both Friday and Saturday evening. These passes are available in both General Admission and VIP Experience options. A limited amount of discounted "Early Bird All That Jazz" Passes are available. Buy now, bundle, and save! A 3-Day Festival Pass grants entry into the beautiful Telluride Town Park from Friday through Sunday. This includes access to the Main Stage shows, craft and food vendors and more! In addition, we’ve teamed up with the Telluride Historical Museum to offer free museum entry for all pass-holders. Night Owl? Consider an ‘All That Jazz’ Pass for access to "Jazz After Dark" late night shows on Friday and Saturday evening. Camping? Stay close to the festival action! Check out our 4-Day Camping, Car Camping and RV Camping Passes. Earn your pass! We have plenty of volunteer positions open. Help make the festival happen, have fun and receive a 3-Day Festival Pass. Jazz After Dark at the historic Sheridan Opera House. One pass grants access to three shows! After the festival ends in Town Park on Friday and Saturday (August 3rd and 4th), the music will continue into the night at Telluride's coziest nightclubs and historic venues. Here, you can catch your choice of acts in an intimate, up close and personal setting. The new “Jazz After Dark” passes will allow attendees to visit any of the venues freely, instead of purchasing tickets on an individual show-by-show basis. Available for both Friday and Saturday Night. Planning to do Jazz After Dark Both Nights? Consider an "All That Jazz" Pass or a Patron Experience Pass, where "Jazz After Dark" admission is included. Camp out at the Festival in the heart of the Rocky Mountains in Telluride Town Park! With the Festival grounds and scenic hiking trails located just steps away, camping is the ultimate way to experience all that Telluride Town Park has to offer. Surrounded by towering mountain peaks, the picturesque campground is a great and social way to experience the Festival. At $50 per person for four nights, camping is also the most affordable way to stay in town. A Camping Pass includes access to the Festival Campground from Thursday, August 2nd to Monday, August 6th. The Festival Campground is located adjacent to the festival grounds. A limited number of RV and Car Camping Passes are also available. Prefer a hotel or condo? Browse our lodging recommendations here. Festival Passes go on sale in two weeks on Friday, February 1st at 10 am (MT). Don’t miss out on limited availability passes and special Early Bird pricing. Contact us here with any questions. 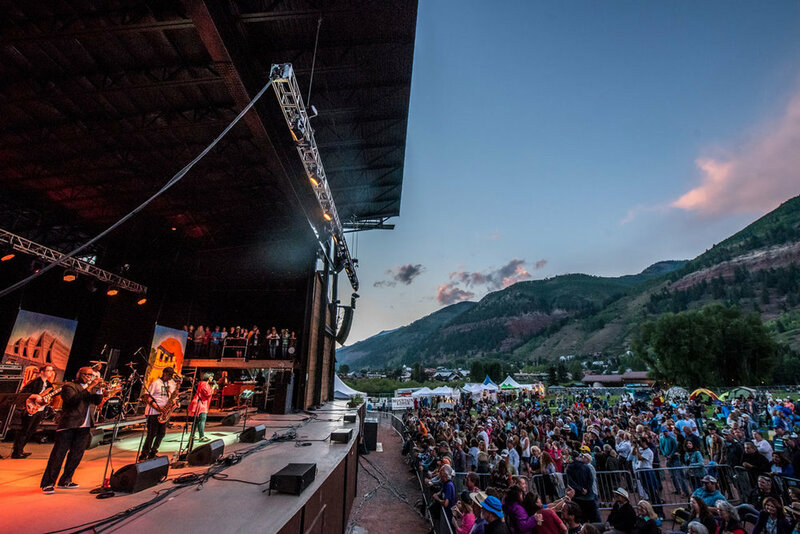 We hope you join us in the breathtaking Telluride Town Park for the 43rd Telluride Jazz Festival this August 9-11, 2019!